Do you remember all of your favorite bits from the old Peanuts movies and holiday specials? Well, so do the people behind the new Peanuts movie and they can’t resist showing it. That is the biggest problem with an otherwise wholly enjoyable movie: that it offers little the viewer hasn’t seen before. That is assuming, of course, that the viewers are familiar with the past film versions of the Peanuts gang. Or that they are familiar with the Peanuts gang at all. 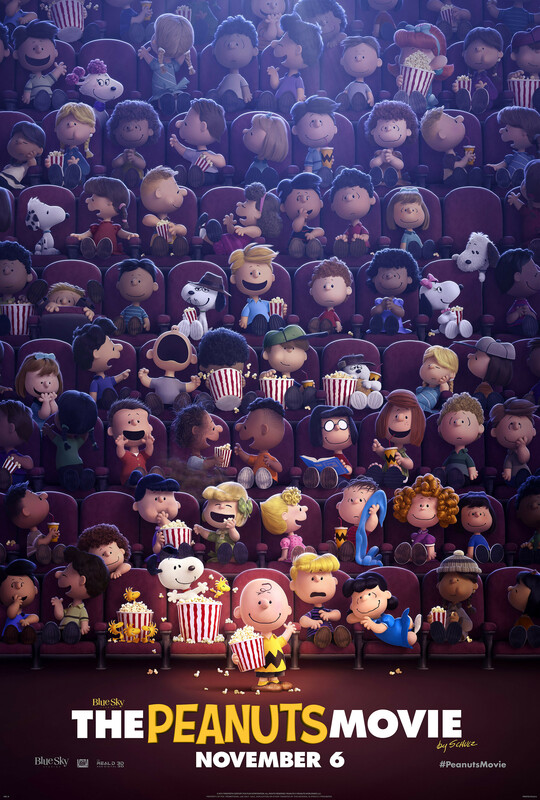 Judging by the crowd in the theater I saw the movie in, they might not be and so The Peanuts Movie is a nearly perfect way to introduce them to Charles Schulz creations. Like many Peanuts films, The Peanuts Movie has a nominal central plot thrust, Charlie Brown trying to work up the courage to talk to the little red haired girl, but is told in a series of loosely connected episodes. It starts with Charlie Brown ignoring the snow to practice summer activities like baseball and kite flying. Like the rest of the film, it is charming if familiar. That initial snow day, which includes a reprise of the skating sequence from Merry Christmas Charlie Brown, serves as an introduction to both the primary characters, Charlie Brown, Lucy, Linus, Sally, Snoopy and Woodstock and an introduction to the idea of Charlie Brown as a lovable loser. From there it introduces the little red haired girl, as well as the rest of the Peanuts gang, and Charlie Brown’s quest to win her affection. From there the movie falls into its episodic format. It intersperses scenes of Charlie Brown coming up with a new idea to gain the attention of the little red haired girl with scenes from the book Snoopy is writing about his battles against the Red Baron. While Charlie does have a goal, it mostly exists as a loose narrative structure to hang the scenes the movie wants to show on. Some of the episodes are better than others. Snoopy’s get to be a bit much, but they are easily the most visually impressive of the bunch. Seeing the dogfights with all of the biplanes, and Snoopy’s doghouse, twisting around each other in midair is amazing. The story of them is thin; Snoopy meets a lady dog pilot who gets captured by the Red Baron, so Snoopy fights him to save her. Simple, but fun. As far as Charlie Brown’s segments go, I liked the school dance the best. The talent show seemed to be pressing the characters and their interests a bit too much. The school dance, though, has Charlie Brown learning a skill the he could conceivably learn and then, in true Charlie Brown fashion failing utterly to employ it. Even when he does, he is interrupted by happenstance. Charlie Brown can’t help but fail even when he succeeds. The test and Charlie Brown’s elevation to resident genius is also fitting, with his one true success being not his at all. The Peanuts movie may be a greatest hits album of memorable Peanuts moments, but it is a well put together greatest hits album. It gives every member of the gang a moment or two to shine, even though few of them get the chance to really matter in the course of things. Hopefully, this is a precursor of better, more focused Peanuts movies to come. As it is, it is a fun animated movie in a year that, Inside Out aside, has not had too many of those. Snoopy and Charlie Brown: The Peanuts Movie will serve young children well as a Christmas outing, but whether it serves the child that remains in all of us early Peanuts fans is another question.